Living on a river has many attributes. Mosquitoes are not one of them. The River House architect was one smart cookie for situated in the back corner is the quaintest little screened in three season porch. Hello summer breezes and goodbye bugs. The prior owner was elderly and didn’t use this room much. (One of my neighbors said all she ever saw in this room was cobwebs and dead plants.) But when I saw this space, the potential for it was boundless in my brain. Three Season Porch in its abandoned state – ooooh, the potential . . . Even though the color scheme was the oh so dated orange of the original exterior, our first summer here I really didn’t care. One Pier One trip later and this little gem was tricked out enough to accommodate lazy cups of morning coffee while drinking in the magnificent river sunrises. Seriously. It doesn’t get any better than this, people. The best part of this Phase One photo is that it is summer . . . look at all that green. (I purchased two chairs for this space but at the time I snapped this pic the second one was on back order.) For extra seating in this cozy space I originally used an old piano bench which also doubled as a coffee table when entertaining lucky guests with whom I shared many a laugh and occasional glass of wine. Its narrow scale was perfect as oftentimes we had many people in this space on summer evenings, so extra seating from the ottoman and bench came in quite handy. The Mama Kitty enjoying a summer afternoon snooze. Case in point, our aging fluff ball, Dolly, enjoyed the additional seating this antique chair in the corner provided. Our second summer on the river was the summer that we tackled the exterior painting which I chronicled in a previous post. When we did so, I somehow talked Cowboy into the risky concept that painting the entire porch white would be a great idea. He was against my shabby chic shenanigans initially but I eventually won the the squabble and he acquiesced to my vision. Here she is mid paint job . . . I need to look through my photos to find a summer “after” picture – this is its current state but it is March in North Dakota so the storms and wood panels are still on, and the world outside is still sleeping in its brown pajamas. In just a few short weeks the world will be green again and the warm air will be enveloping all who come here to sit for a while and drink in a little chilled lemonade along with God’s emerald beauty. A vision I always had for this porch was incorporating a swing bed. (Our next house has an even larger three season porch so stay tuned to see if I can get Cowboy to whip one up!) Here’s one of my favorite designs. Perhaps the new owners of The River House will think so too and this little porch will continue to evolve in purpose and practicality. I can just imagine the glorious naps a person could take here . . . can’t you? Our cat named Mouse (this is what happens when little girls name kitties) slumbers in the porch. Sweet nooks and crannies like this are where life unfolds, and this cozy indoor/outdoor space is truly a treasure of the The River House we were so blessed to enjoy while it was our home. Painting an outdoor space white is tricky. One aspect that contributed to this decision was the fact that this room has no outside access; therefore, there is not opportunity for mud and dirt to be tracked in. It does get dusty in here but nothing that a good mopping and cleaning once a week can’t alleviate. The white makes the smaller space feel larger. Had we lived here longer I eventually would have had the entire pallet for this room be white, ivory and muted colors to keep the spacious feeling. There is something about vintage that says “home”. 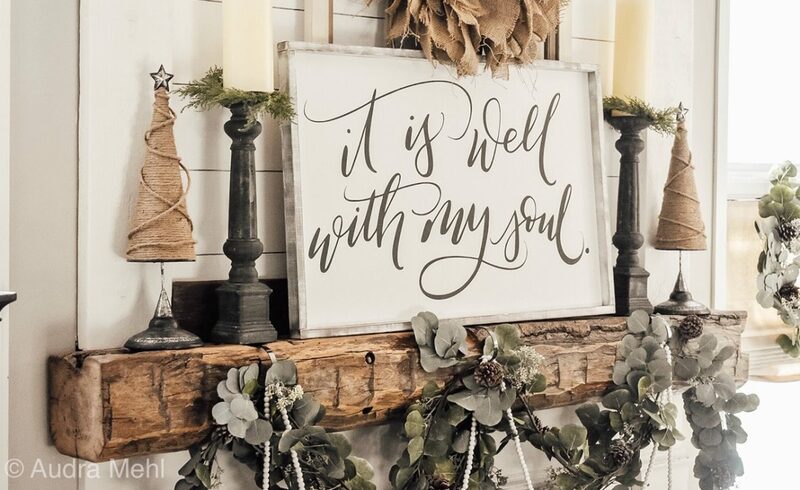 You needn’t live on a river, or in the country, to insert a little country into your world and attain that same cozy Grandma’s back porch feeling. Reclaimed furniture (the side table is actually a refurbished sewing table) and chipped pieces are quick ways to achieve that “escaping to the farm” feeling. Thank you for stopping by our little porch! I hope you enjoyed it as much as we did.